Here in California, we LOVE a trip to the beach. There’s nothing like driving up PCH and smelling the salt in the air, hearing the waves crashing, and feeling the warm sand in between your toes. However, some people do not have the luxury of hitting the coast on a whim. 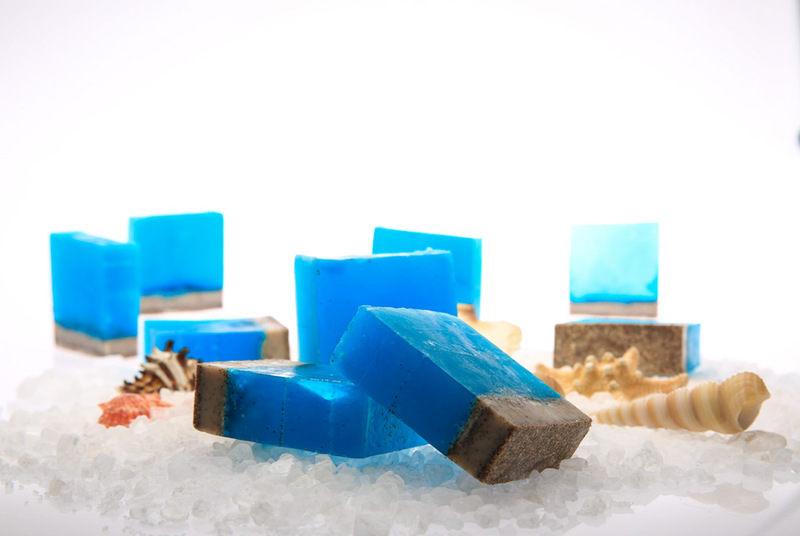 So we at Essentials by Catalina have creative soap with skin-loving benefits of algae and resembles our beloved west coast. Algae extract is rich in iodine, which is known to reduce the appearance of cellulite. Perfect for summer! The Walnut Shell Powder paves the way to new skin, and the kaolin draws out grime from pores. 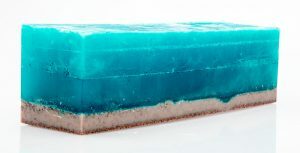 A wide silicone soap mold: the one used is a 54-ounce mold. Algae Extract: .5oz sea extract that promotes skin tightening. Essentials by Catalina Soap Colorants: Blue, and Green. Walnut shell powder: 1 oz exfoliate and for looks. Fragrance oil: .56 (1%) Tropical or nautical fragrance, for example beach hair. *Optional* (enough to sprinkle on top, or add throughout) Midnight sky glitter. scale: Measuring out materials by weight is important. 2 large glass containers: not too big, but big enough to hold the soap. heat source: Microwave or hot plate. pipettes: one for each colorant and fragrance. Mixing tools: Do not use wood in risk of splinters going into the soap. Alcohol in a spray bottle: for spraying in between layers and the top. In one container melt 10 oz of soap. Then add 1 oz of kaolin clay, and 1 oz of walnut shell powder, and about .25 % of fragrance. Mix well making sure all of the clay is dissolved. Then pour it into the mold and spray with alcohol. Let it set until stiff, however it should give when you press it (about 1.5 hours). Press it down in random areas to give it an irregular natural look. Take the loaf out and make sure it is solid before you cut. Feel Free to add glitter or your own personal touch. 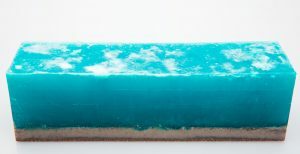 This bar is meant to look good and be good for the skin. 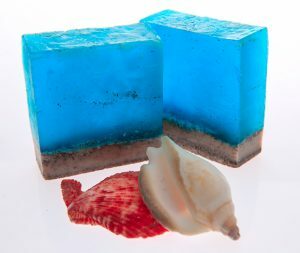 Market this soap by itself, or pair it with another summer-themed product. Want to try this on your own? Get everything needed for this recipe by clicking here. There will be a considerable amount of leftover materials. Be sure to include any colors or scents you may want to try.